Regular readers will know we’ve been investigating where blues style playing has been applied to other genres - sometimes with surprisingly little alteration to traditional vocabulary. 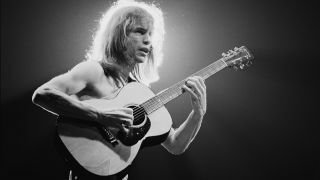 At other times, a few essential licks are cross-fertilized with other genres - this is where Steve Howe comes in. His early influences included players like Speedy West and Jimmy Bryant, Les Paul and Mary Ford, plus Wes Montgomery and Chet Atkins. Listening to the work of any of these, plus Steve’s own playing on tracks like Close To The Edge, Starship Trooper and Clap will give you an alternative take on how to phrase lines and arrange chords. Some of the ideas will feel familiar under the fingers, but some won’t - and I guess that’s what I’m aiming for with this article. Steve’s playing is expressive in a completely different way to someone like Albert King, though his sharp tone and attack sometimes evoke similar dynamics. Like jazz players, slides (called ‘slurs’ in the more old school jazz circles) are more common than string bends. Steve uses a fairly heavy gauge string set, which precludes too many wide bends and wobbles, so I’ve tried to reflect that here. It’s certainly interesting to take (often) subconsciously applied techniques like these out of the mix and see where it pushes you - the same applies to changing/reducing the gain. Changing any fundamental detail of how you usually set up your tone can open doors for new ideas. The second twist: we’re in 7/4 time - very popular in ‘prog’ rock styles like this. I recommend jumping in without giving it too much thought - you’ll be surprised how intuitive it can be soloing over odd time signatures after just a few minutes. Most importantly, I hope enjoy trying out these ideas and see you next time! Taking an old school pentatonic idea on the open strings and applying it to this 7/4 time signature gives an interesting twist. Let the notes ring together as messily as you like, while keeping an ear open for beat 1 of the next bar. Be ready for a wide position shift! In the first half of this example, the more melodic phrasing switches register and acts as a set-up to the second half. Targeting, or accenting certain beats over the backing track can lead to interesting cross rhythms between the lead line and the backing track, while bursts of rapid alternate picking draw from Steve’s Les Paul influence. This harmonised three note shifting chord pattern is a real departure from pentatonic blues licks, but comes from a pentatonic based melody on the low E and A strings. Like some of the other ideas, it’s tricky at first, but once your fingers are ‘programmed’ to fall in the right places it’s very effective. Ideas like this tend to work better with lower gain settings like this, but your experience may vary!